Very often are we floored by a custom bike that takes the original model and turns it into something that’s better than what we expected. Yet that’s what 27-year-old Benjamin Blanchard was able to accomplish. The French graphic designer took a Triumph Speed Triple bike and injected some straight up attitude into it. Already sporting a powerful 1,050cc DOHC three-cylinder, fuel injected engine, Blanchard went out of his way to re-model the bike to his liking. Carbon fiber was used on the bodywork of the bike, with incredible detail put on a lot of its parts. The prevalent use of carbon fiber on the bike drastically reduced its weight, making it lighter and faster than any of the standard Speed Triple’s out there. The light weight of the bike, combined with its powerful engine, has turned an already impressive Speed Triple into the Impoz Speed Racer. It takes a really impressive presence to catch our attention. Benjamin Blanchard managed to achieve that - and more. 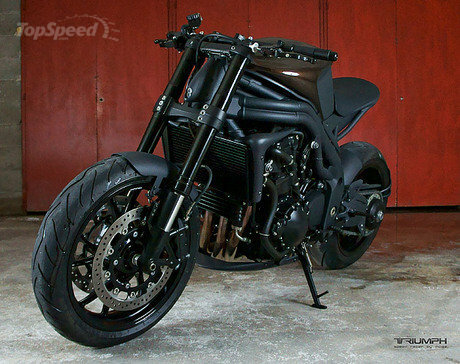 Triumph Speed Triple "Impoz Speed Racer" originally appeared on topspeed.com on Monday, 27 June 2011 23:11 EST.